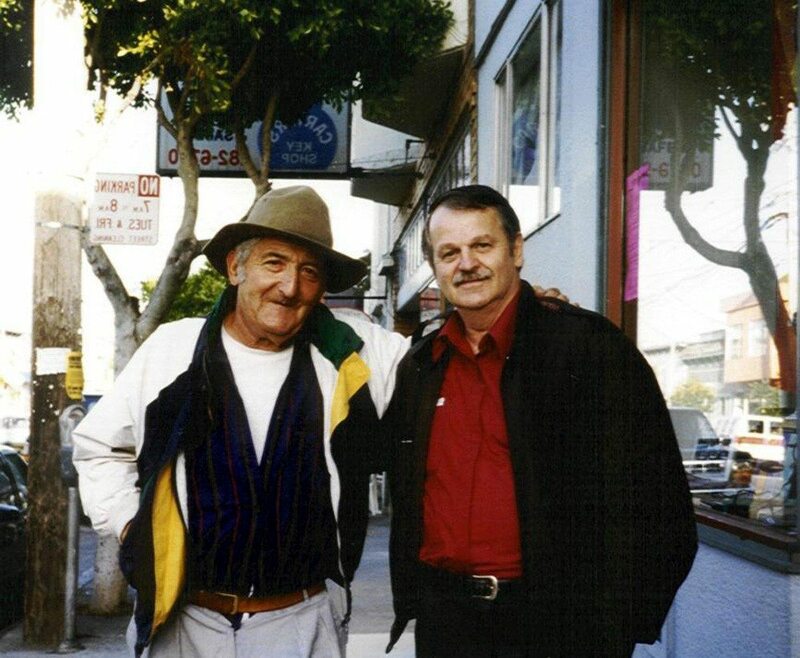 Jack Micheline and A.D.Winans, San Francisco, 1996. On Friday, February 27, 1998, I learned of Jack Micheline’s death. He was found dead on a Bart train, apparently the victim of a heart attack. Micheline was described on Cafe Blue, The Internet, as “One of the lesser Beats,” but was the author of twenty books of poems. He was 68 years old at the time of his death, and was suffering from diabetes. 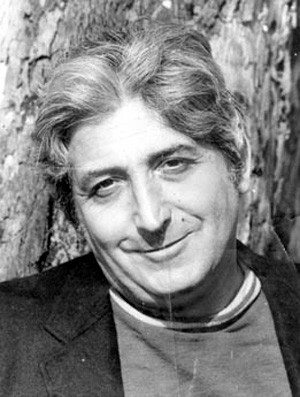 He was born in New York, under the name Harvey Martin Silvaer, and worked as a union organiser before dedicating his life to poetry and painting. While in New York, he frequented the bars and coffee houses of Greenwich Village, walking the streets with the likes of Jack Kerouac, who wrote an introduction for Micheline’s first book of poems, “River of Red Wine,” which was favourably reviewed by Dorothy Parker in Esquire Magazine. Micheline was the last of the authentic “street” poets, uneasy in a poetry world turned business. He never sought fame, choosing to write about the people he cared for: hookers, drug addicts, blue collar workers, and the dispossessed, and he did it with and from the heart. With the death of Bob Kaufman, and now Micheline, there exists a deep void in what was once referred to as “street poetry.” Jack Kerouac, in his introduction to Micheline’s “Red River of Wine,” said, “His sweet lines revive the poetry of open hope in America,” and Charles Bukowski admitted to me that even he couldn’t touch Micheline when Micheline was writing at his best. Does this sound like one of the “lesser” Beat poets?” I think not! Micheline’s words remind me of the lines from a poem by the late William Wantling: “I never wanted to be a poet. I would carry a lunchbox just like the rest of them if only the muttering would leave me alone.” We are fortunate that the muttering never left Micheline alone. It took a force no less powerful than death to silence the muttering. Micheline’s poems were heartbreaking, and real; not the street pose that too many poets try to take, but slices of real life; poems from the gut and the hearts. His poems came from street life experience, not from reading Charles Olson, Robert Creeley, or William Stafford. He knew that true poets don’t choose poetry, that it chooses you, and that in the end it is the way you live your life that counts. He knew that the only thing a poor poet owns is his integrity, and he knew even more that if you sell this intangible asset that you will have sold the only thing a poet can claim as his own. On his death, several newspapers paid tribute to Micheline, two of them describing him as a Beat Icon, but his poetry extends beyond any label put on him. Micheline, in fact, never wanted to be called a Beat poet, preferring to be known as a Bohemian. On March 3, 1998, they held a memorial service for Micheline, at a church near where he lived. The church was inconspicuous in that it bore no name or cross; the kind of church Micheline would have felt comfortable in. 300 people crowded into the church to pay their respects with recollections and poems. There were the usual poetry fakes: a poet proclaiming to be a life long friend of Micheline; Lawrence Ferlinghetti sending a message saying how much he respected Micheline and his work; the same Ferlinghetti whose City Lights Bookstore doesn’t stock a single title of the over twenty books Micheline has published. But these people were in the minority. Poet and friends alike stepped up to the podium; some of them sharing stories about Micheline; others reading poems of his, or poems dedicated to him. Ken Keasey, recovering from a minor stroke, sent a message praising Micheline and his body of work; Michael McClure and Harold Norse read short poems, and Herbert Gold talked about meeting Micheline in New York in 1953. A jazz musician (saxophone) played in the background. Death is as savage a beast as there is. She spares no one. The San Francisco poetry scene, and the poetry scene at large, is diminished by Micheline’s passing.